So we did the most naive thing anybody could think of: We wrote cold email inquiries to the (basically famous) A-listers of our industry – bloggers with millions of monthly readers, bestselling authors, social entrepreneurs and coaches with ridiculously successful businesses, and the list goes on. We let them know that we admired specific professional decisions they had made and certain character traits they had displayed publicly over the years, and that it would be a dream come true if we could learn directly from them, perhaps by volunteering our time to assist them with some of their active projects. We should have known better, right? These were some of the busiest people on planet Earth! Who were we to think that they would reply to a couple twenty-something dreamers with no publicly recognizable skills whatsoever, beyond, perhaps, the ability to write a coherent email? And we subtly asked them to offer us their mentorship… And we suggested we would volunteer, when they obviously already had successful teams of people they trusted… We were NUTS, weren’t we? Then an unimaginable thing happened. We received an email reply… and a second… and a third… And over the next few years, we found ourselves learning from and being directly and indirectly mentored by an enormously successful group of people who were undoubtedly our biggest heroes at the time (I’ll spare names and details out of respect for personal privacy, etc.). One day, several years later, five of these same mentors – who were now our friends – joined us for a face-to-face mastermind meeting that was part of conference we were hosting. And one of them randomly joked that she had gotten to know us through a cold email inquiry we once sent her. The room went quiet for a moment. Then, at the same exact time, our other four mentors who were present in the room started snickering and nodding their heads in agreement that they too met us through a simple, cold email inquiry. The whole room broke out in sincere laughter. “Do you know why I decided to meet with you both?” one of them asked. Angel and I smiled and just looked at each other. Angel and I looked around the room. The others were again nodding their heads in agreement. Needless to say, we learned something important about life and business that day. Can you relate to our story in any way? Anything else to add? Also, if you haven’t done so already, be sure to sign-up for our free newsletter to receive new posts like this in your inbox each week. This post is an excellent reminder … who we spend time with literally changes our lives. Personally, I know I’ve been been spending too much time with the wrong people and not enough time with the right ones lately. I need a mentor, but I also need more quality peers to bounce ideas off of. I think your strategy of “giving first” makes sense for building solid relationships with almost anyone – friends, peers, teachers, mentors, etc. Also, I just purchased your paperback book for both my sister and myself, to help us get on the same page with nurturing our relationship, and find some healthy motivation. 🙂 Thank you so much for everything you share. I completely agree, Beth. This same strategy is relevant to nurturing all kinds of relationships. I have really enjoyed reading your strategies for living. As both a Pastor and a Mental Health Counselor, material from your blog, book and emails have been integrated into my lessons. This particular post is a topic so many people overlook – GIVE first! Good deeds often come back around, one way or another. Most people will notice and respect your support and service. Well said, Dr. Kelsy! And thank you for sharing our work. I wanted to thank you for your daily tips! I receive your e-mails and more often than not the insights contained within are the ones I need to hear that day! Believe it or not, I just reached out to a potential mentor yesterday. She hasn’t responded yet, and I think I now know why. It’s time to change my approach. Also, I strongly believe that we all need to fill our lives with those that lift us higher.. energize us… and so much more! Who we spend time with makes a big difference. This past September, when I attended a conference as an event photographer, I met you both! We were crammed into the loft of a local coffee house and we struck up a conversation. We talked mostly about being parents of boys. Imagine my surprise the next day when I learned you were featured speakers! And here I thought you were “normal” people like me ready to grow and learn about simple living. I was humbled by your genuine desire to hear my story, and that you were both just like me in many respects. I had never attended a conference where the speakers were just ordinary people willing to tell their story in hopes others could gain a benefit from it. I’ll never forget how I met you, and felt we we’re kindred spirits in this thing we call life. Your willingness to connect with other people made a lasting impression on me. We ALL have value, and a story to share. Thank you for that!!! Interesting. I like the respondent’s post that stated perhaps it’s time to change the approach. Poignant self-reflection. Sometimes the responses we get can be a mirror of what we project. As someone who is hypersensitive to others reactions, navigating the social arena is quite difficult at times. My own hypersensitivity may hinder my ability to make the professional connections I need to really become seeded. Lots of food for thought. Thanks to all for contributing! Great article. I interview prominent people in my field and at first I felt like, who the heck am I to ask these busy, successful, interesting people to interview with me for free? To take time out of their busy day to share tips with my audience for no reason? But as time went on more and more people were saying yes, and I started to ask myself why. I finally learned that they felt that I was giving them something I hadn’t thought of (as a newbie blogger) – exposure to my audience at no charge. They felt I was being generous with them for that reason, and so they were generous with their time and ideas in return. After getting to know them through the interview process, I’ve keep in touch with many of them and consider them mentors each in their own way. It never hurts to ask, as you said – just be generous! This is a great topic! My company will be going through a merger or a breakup this year, so I am busy getting myself for whatever change comes down. I will be getting a vital certification next month, and have begun establishing a new second income in real estate. One of the things I know I will need is a mentor as I get these things going, and you idea of volunteering is the “right” approach for me. I can leverage my project management skills to just about anyone. Glad this post helped in some small way, David. We’re sending you good vibes as you enter this transitional (and growing) period in your career. Yesterday a woman on our neighborhood Internet site wrote that she had some free startups for cardboard palms from her yard. I love this well mannered, carefree plant that can cost $40 at a nursery. As I reached for my gloves to head over there, I saw a second new pair in the package and brought them to her. She was genuinely surprised and thanked me back. That made two smiles instead of one. I naturally ask what I can do to help when there is a need. It doesn’t have to be anything big, just a genuine desire to help. I didn’t always have money to give, but I could always give my time or services, and I’ve never expected anything from them. I’ve found that many times the natural response from others is to return the kindness, and I do not deny them the opportunity, as it seems to give them pleasure, the same as I feel when I do for others. You get to know the true character of people during these times. Sometimes I am surprised to find who the real quality people are in life. Many times “success” is only equated with material possessions, but I discovered there are truly successful people at all economic levels. Those who are the most content are the truly successful, and they are the ones I choose to be around. Great article! Great advice. I’m a new entrepreneur and coach, and if there’s anything I can do for you, let me know!!! I would like to thank you for continuing sending me articles in my email that I eagerly read each time. I know I should have purchased your book and attended some live training by now, but I just couldn’t find time. I am with two other programs and membership courses and working on my websites. Maybe soon though. Thanks again for making a difference to people’s lives. So many things in that post…..taking action, taking a risk, wanting to be involved, working towards something one step at a time, what is there to loose? Reminds me of this: in order to keep it; give it away. I am so grateful for your daily posts. You never know where a connection to a life changing experience will come from. Always keep the door open and watch magic happen. Wishing you an incredible day. Thanks, Marc and Angel, for a great reminder about the power of generosity. I have used this “strategy” on and off over the years, not always appreciating what I was doing. I realized a few years ago that being generous (with time, ideas, support, etc) is like planting seeds, not knowing what will grow. Just going out and asking for stuff is like harvesting… but if you’ve not planted, there’s nothing to harvest. Reading this post and the wonderful comments from others makes me want to get on the phone and set up a few more meetings next month to follow thru on some offers I’ve made. Being generous takes time, yet it is so powerful for building a community, a tribe, and a business! “Just going out and asking for stuff is like harvesting… but if you’ve not planted, there’s nothing to harvest.” Thanks JimSmithOnline for the beautiful and powerful image used to explain this important topic! 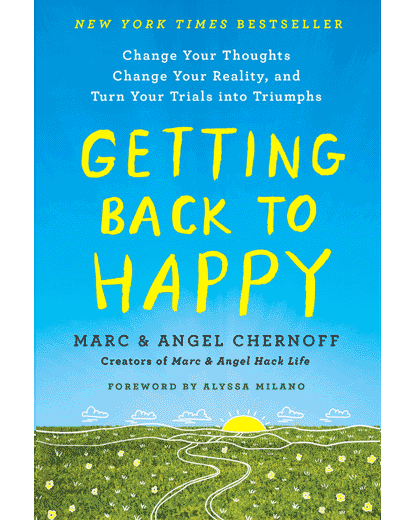 And thanks, Angel and Marc, for helping us become a better version of ourselves and achieve our personal and professional goals with your transformational posts! And thanks to you all, dearest readers, for your wonderful and powerful comments! My mum always told us not to be a bag that only receives and never gives something back. She is right. Give and you will receive even without asking. This applies to our whole life : personal and professional life. This post is awesome, and the lesson here is to be careful with the type of people we spend most of our time with. Thank you Marc and Angel for sharing good posts with us, they are real motivating and eye opening as well. I have been looking for a post like this one. When you find yourself alone in a new country to start over, needless to say how hard is it. Trying to find and build a team with new unknown people who are sharing the same vision with you, is not easy. However patience and being aware of what you are really looking for, can be helpful. I check your blog everyday to keep myself motivated, create and chasing opportunities. Thank you for all your sharing! Do you have any advice for someone starting out but not twenty something? Being older it’s expected that one be successful already. So in the situation where there’s an age factor, not a lot of office skills, and cannot afford to work for free, starting over from scratch, what would you advise and recommend? Thank you, I like your article and agree that relationships are about caring for others, understanding their needs (physical or emotional). In general I would like to see more people focusing on building relationships with their families and friends. Every so often, when we don’t have mentors around us who can point us to the right direction, we open our media in hopes to find some guidance. Today your post gave me a boost. I see what I have done in the past when the people around me guided me in the right direction and all of a sudden everything seemed to stop. I realized what natural trait I had put a halt on and need to pick up again. The more sincere you are in giving first, the greater it will show. And not everyone will respond, but that’s why we adopt it as a trait, not as a way to seeking to receive.